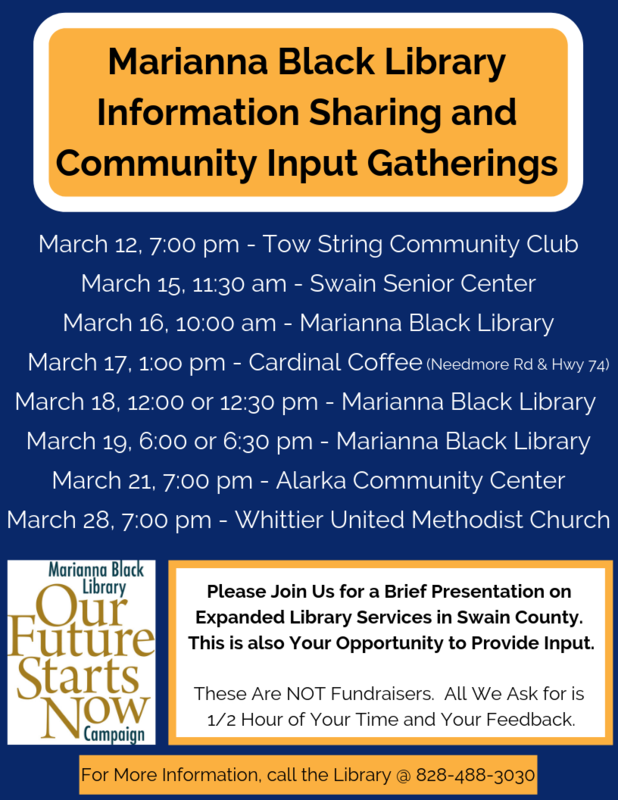 The Marianna Black Library in Bryson City has been planning for expanded library services in Swain County and would like to share some information with the community. Not only that, but we would love to hear your ideas and opinions regarding library services in Swain. Please plan to join us for one of the Community Input Gatherings listed below. The presentation will only take 15-20 minutes and then there will be time for comments, questions, and answers. These are not fundraisers. We are only asking for a small amount of your time and your feed back. For more information, please call the Marianna Black Library, at 828-488-3030. 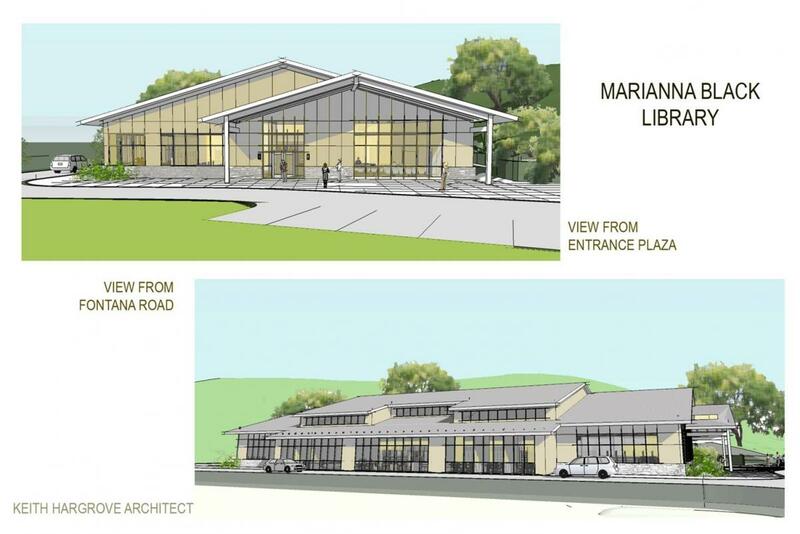 On October 26, 2017, Asheville based architect, Keith Hargrove, and Marianna Black Library Board Chair, Ellen Snodgrass presented to a series of renderings of a new library to the Swain County Commissioners. The presentation began with Snodgrass running down a brief history and timeline of the new library project, including new information regarding a reduction in size to save on building costs and ongoing operational costs. Hargrove then presented several renderings including a topographic look at the site development (patron and staff parking, D.O.T. 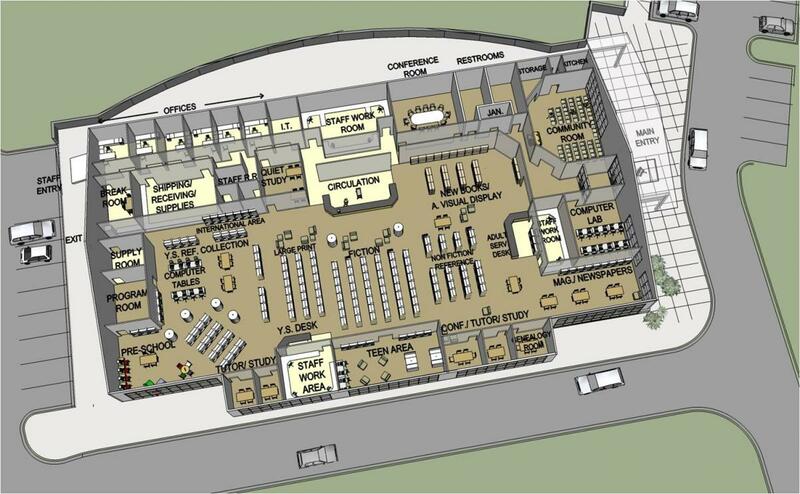 right of way and outdoor reading areas) and birds-eye view of the interior, including a computer lab, expanded youth services spaces (including a teen area), and several tutor and conference rooms for collaborative work. After the presentation was completed, Swain County Commissioners, library board members and staff, and members of the community had a public discussion concerning the future of a new library. Though a financial commitment was not put forward by county commissioners, they agreed to become more involved in the project by appointing a member of the commission as a liaison between the library planning committee and Swain County. 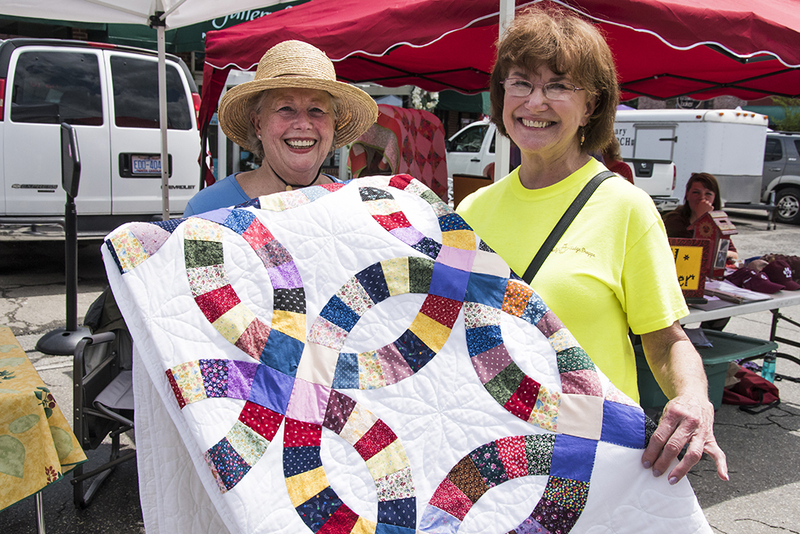 Marcia Winchester (right) of Bryson City was the winner of the double wedding ring quilt raffled by Marianna Black Library as a fundraiser for the new library. The winning ticket was drawn at Freedom Fest. According to Margaret Varner (left), quilt committee chair, $1,716 was raised for the campaign. The fabric for the quilt was donated by Jacque May in memory of her mother Elizabeth Hamm. The quilt was pieced by Maddy Haughn. Custom long arm quilting was done by Liz Butler and Patti Simpson of Ivy Lane Quilters. 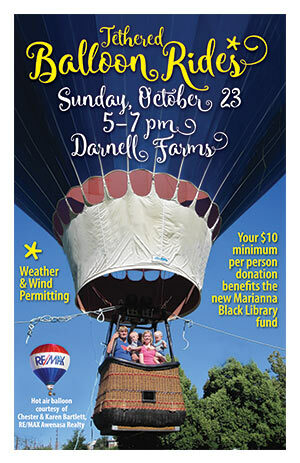 Hot Air Balloon Fundraiser for the New Marianna Black Library Campaign Fund - Sunday, October 23, 5-7 pm, Darnell Farms - wind and weather permitting. For a minimum $10 per person donation, folks can climb into the gondola and be lifted up to the end of a 40-foot tether for a panoramic view. Inflation of the balloon begins at 4 pm, with lifts from 5-7 pm. Thanks to Chester and Karen Bartlett, of Re/Max Awenasa Realty, for arranging this wonderful event! The New Library Campaign Committee is holding a quilt raffle fundraiser. The quilt is a queen-size, double wedding ring pattern, and is on display at the Friends of the Library Book Store. Raffle tickets are for sale at the book store and at the Marianna Black Library. Tickets are $3 each, $5 for two, and $20 for eight. The drawing will take place July 4, 2017. The fabric for the quilt was donated by Jacque May in memory of her mother Elizabeth Hamm. The quilt was pieced by Maddy Haughn. Custom long arm quilting was done by Liz Butler and Patti Simpson of Ivy Lane Quilters. The quilt has an estimated value of $800. Pictured (l-r): Patti Simpson, Maddy Haughn and Liz Butler. The New Library campaign is excited to announce two fundraisers to help kick start funds to furnish the new library. On Wednesday, March 16th at 6pm the Campaign will host a Chicken Parmesan Fundraiser Dinner at Pasqualino's Italian Restaurant in Bryson City. Purchase your ticket and enjoy a great meal while you support this initiative! In addition, the Campaign is selling seed packets, which include a variety of heritage seeds. You can purchase seed packets directly from the library or use the code MBL2016 when purchasing through the Sow True Seed catalog or website. 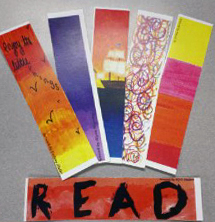 As part of the awareness campaign for the new library, Swain County High School students designed and produced 12 colorful bookmarks, which are available at the checkout desk at the library. The Marianna Black Library Campaign Committee would like to thank the digital media students, as well as their CTE teacher Nathan Medlin, and Anna Hair, Director Career & Technical Education, for their contribution to the committee’s local marketing efforts. 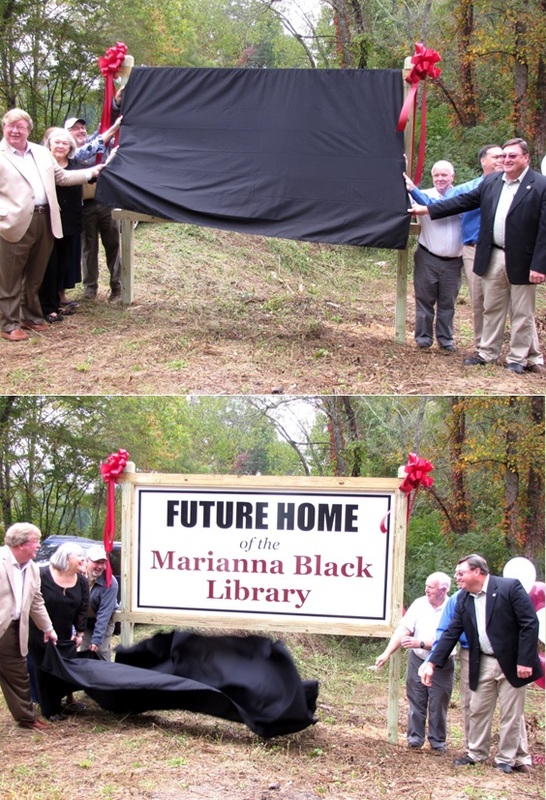 New Sign Designates "Future Home of the Marianna Black Library"
On the morning of October 2, 2014, a new sign was unveiled in Bryson City declaring "Future Home of the Marianna Black Library." This brings us one step closer to building a new library in Swain County, after 9 acres of land was donated to Swain County in May (see below). With nearly perfect weather contributing to the magic of the morning, over 50 members of the community were shuttled to the event (still no parking lot at the location). Then, after the unveiling, a reception was held at the Historic Calhoun House on Everett Street, where everyone was able to converse, ask questions, view parcel documentation, and even sign up to get a library card! With this latest step towards a new library, everyone involved with this project is excited to see what lies ahead in the near future. If you'd like to become more involved with the campaign to build a new Marianna Black Library, please call the library at 828-488-3030 to find out how you can help. It was an evening of generosity and excitement on May 8, 2014, because it was during a barbeque dinner event that it was announced that Don and Toni Davidson were donating approximately 9 acres of land to Swain County to be used exclusively for a new library. Then, as though that were not enough, the Davidsons donated an addition $50,000 to initiate fundraising for a new library. The donated land is located on Fontana Road, approximate ½ mile from the train tracks in Bryson City. The generous donation of funds will be used to create an account for a fundraising drive to purchase furniture, fixtures and equipment for a new library in Swain County. Pictured from left front row are Heidi Woodard , Friends of Marianna Black Library president, Don and Toni Davidson and Karen Wallace, Fontana Regional Library director. From left back row are Tom Sutton, Bryson City mayor, Jeff Delfield, Marianna Black Library librarian, Phil Carson, Swain County Board of Commissioners chairman and Chester Bartlett, Marianna Black Library board chairman. Where is the Donated Land? Approximately 1/2 mile north of downtown Bryson City on Fontana Road. To read the Campaign Case Statement click here, or click here for a summary. For questions or more information, please call Jeff Delfied at (828)488-3030.